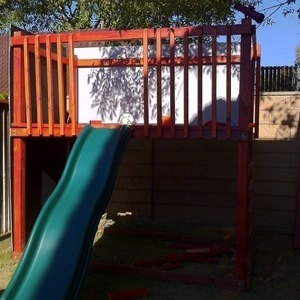 Last Summer we decided that our two sons (4 and half and 9 months) needed a play structure outside. Obviously it needed to last since one of them was so young. I decided instantly that a store bought structure would not work, the wood just would not last and the growth potential would not work. So we (my oldest and I) decided we needed make one from scratch. Phase 1 is a simple platform, ladder, and slide. With 1 wall being a chalk board, a pirate flag, and a telescope, the early uses are an endless slate. Phases 2 and 3 will be a roof and a deck for the lower level.